Reviews | Wall Mount Bottle Opener - 3 1/4" X 2 3/4"
Wall Mount Bottle Opener - 3 1/4" X 2 3/4"
Equip your bar or restaurant with this wall mount bottle opener! 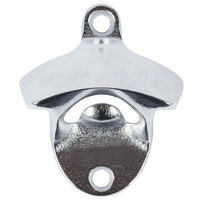 Designed to hang on walls, this opener is extremely handy for bars or food counters for beverage service. Once mounted, this opener provides extreme stability, helping you effortlessly remove the caps from even the trickiest of bottles. From beer bottles to old fashioned soda bottles, this device allows you to keep the fast-paced flow going in your busy establishment. There's no need to keep a handheld opener in your pocket so you don't have to waste time digging it out or searching for it elsewhere. This wall-mounted model allows you to quickly open your bottle and serve your thirsty customers! Its cast metal construction ensures a durable, long-lasting product. Mounting screws are included for easy installation and immediate use. Thick wall mount bottle opener that easily fits under the bar out of sight or can be mounted in sight as well due to its nice visual appeal. Combined with a bottle cap collector, this opener makes bottle opening a breeze. We place these at very convenient locations and increases our serving time. This wall mount bottle opener works just fine, is very convenient, and seems to be very well constructed. I'm sure it will last us a long time. Another great bottle opener. This bottle opener has opened thousands of bottles. Has not had to be replaced, is a great bar tool. We even have one in our home. We use several of these on the backside of our Soda Fountain bar. We sell a couple thousand bottles a week and these bottler openers make the high-volume turn around very easy. This mount bottle opener is SUPER sturdy and durable. I used it with the bottle cap catcher, and its works great. Bottle caps fall right below it. Love a wall mount bottle opener. It is strong and no more looking for the handheld one. Does a great job and well constructed of nice materials. Used these with the bottle catcher #407B4300 worked out well. They are a nice combo together and the stainless steel construction makes them durable enough to use in our outside bars. We will buy more of this combination when we need to. A nice bottle opener to mount underneath the bar for easy opening. The opener is great because it can not be moved so we always know where it is. This product is pretty sweet. As long as you screw into stud or use wall anchors it works great. Because of the motion of pulling with bottle caps it can loosen off wall if not assembled tightly. We're a retro breakfast restaurant and we have soda in bottles, these came in handy and added to the charm of our place. Great quality, strong and durable. We've been using them over a year now. This is a staple for every household! We have one in our kitchen, basement, and garage! A classic design that gets the job done. You can't go wrong with this bottle opener. For the price and need for a bottle opener, this is the one for any bar! We ordered this as well as a bottle cap catcher and it works perfect! The best wall mount bottle opener on the market! Very sturdy and will last a lifetime! I painted mine so I’m not sure how it will hold up to weather conditions as is. Very heavyweight, solid construction. Screws onto a surface easily and stays stable so that it's easy to open any bottle. It also has a very nice finish. We bought these to use at a bottle opening station. Lots faster than the traditional hand opener and solidly built. Easy to clean as well. Nice cast-iron bottle opener. Great for home use or hand made projects. Bought to make groomsman's presents. Would definitely recommend this product! Good quality construction! We serve bottles of soda on my food truck and have this installed for our use. It's a great product for the price and I recommend. This is great if you have a bar at home or just for husband looking for a bottle opener for his beer sometimes. Just point him to the wall all the time! VERY HANDY IN OUR BUSY BAR WE HAVE THEM BOLTED TO THE BAR POST SO IT MAKES POPPING A CAP VERY EASY AND QUICKLY, IT HAS THAT RUSTIC LOOK, LOVELY!! This wall mount bottle opener is super great! It comes with two screws so you can screw in to whereever you want. It's really sturdy with opening our beers daily. Awesome product, very heavy duty and at a very inexpensive cost, Works just as good if not better than the handheld openers and works in combination with a cap box perfectly!!! Fast shipping and great product, solid metal and looks exactly like the picture. I need several for furniture I build and I won't buy from anywhere but here! This bottle opener does just what it's supposed to--opens bottles, with little or no effort. It's very easy to hang and is easy to clean. The Wall Mount Bottle Opener is made of cast metal. It is great, We have two hanging around our pool area. It won't rust, The price is great. This bottle opener is great to have in a bar. If the bartender is busy the customer can open the bottle them self and its kinda fun too!! This is a very sturdy product that takes the bottle caps off very quickly. I love this product and have installed it in multiple places at my bar. We purchased this item over a year ago and considering it is used 6 days a week this bottle opener is still like new and going strong. A bottle opener that you can screw into the wall! Genius! And with a simple flick of the wrist the bottle caps just pop off. An amazing feat of engineering!